Rocky's newfound success makes him an easy target for hungry up-and-comer Clubber Lang. Light on character, big on montages! Manages to raise the stakes and numb you to them. Carl Weathers walks off with the movie. Michelle Pfeiffer's an unstoppable force of charisma. Barely-sketched story, characterizations, motivated musical numbers. Song-wise, pendulum for quality sings violently back and forth. Nonetheless, a guilty pleasure. A doctor suspects a novelty mask manufacturer of deviousness. An original storyline makes for a weird entry in the series - but that's not a bad thing, as the movie takes on Halloween traditions and legends for a superbly spooky flick. Violence, dead kids, moody score - it's a perfect Halloween movie, even without Michael Myers. An older Kirk takes command of the Enterprise as an old nemesis reemerges. Juggles a little more than it needs to, but as an overall meditation on aging and reconciling with the past, much less within the context of a Star Trek flick, you could do worse. A conservative building commissioner falls in love with a prostitute. Candy-colored capitalist critique boasts delicious production values, layered performances, wicked sense of humor. 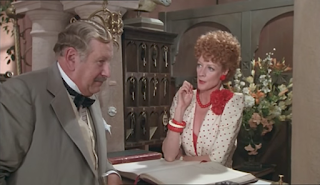 Hercule Poirot solves a showbiz-centric murder at a resort. Campy fun, complete with bitchy one-liners, over-the-top characters, and gaudy costumes. Maggie Smith gets the best lines, but Roddy McDowell's nipping at her heels - and the scenery, for that matter. Sequel to: Nothing; this is the first Rambo flick, baby! Vietnam vet and small-town cops have a disagreement. Treatment of war veterans becomes clear in opening and closing scenes, the latter of which enables Stallone to really give it his all - a much better use of his gifts than Rocky III. But oh my, what a weird little movie.